In the mid-1990's Terence McKenna and Mystic Fire's Sheldon Rocklin teamed up to make this rich and exciting film. Little did they know that this would be their last film. Originally titled Coincidencia Oppositorum: The Unity of Opposites and filmed in Prague with Terence portraying his usual erudite rendition of the Irish Bard, this filmed classic takes us on a journey into the alchemical renaissance of King Frederick V and his wife Queen Elizabeth of Bohemia. 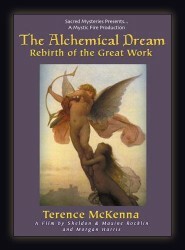 Playing the role of John Dee, court magician for Queen Elizabeth of England, Terence McKenna shows us how the promise of a return to the tradition of alchemy was almost instituted in Europe. He also shows us that this early attempt at the creation of an alchemical kingdom actually lead to the European Renaissance and the institution of Cartesian science and the beginnings of rationalism within the western mindset. This incredible film is not only beautifully filmed but is Terence McKenna’s finest performance and a worthy eulogy to his genius. "tells a fascinating story of political intrigue and bohemian experimentation in the 16th century." 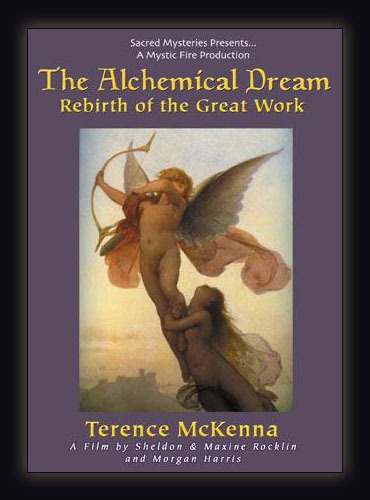 "McKenna brings over the mysterious world of alchemical thought, and it is obvious that he is the ideal man for this job; sufficiently erudite, to present the ideas so that they remain on the edge of understanding, teasing us forward into areas of unexplored mind. This is a film that will be watched again and again, each time giving us a further hint at the meanings behind the alchemical symbolism, nudging our understanding closer to the place of transmutation. Brilliant!" "In the twilight of human history, McKenna's prescription for salvation is just so crazy it might work."